This funny elephant stock photo is sure to capture a viewer's attention...the primary task of any stock image! The very first thing a great stock photo has to do is grab a viewer’s attention. 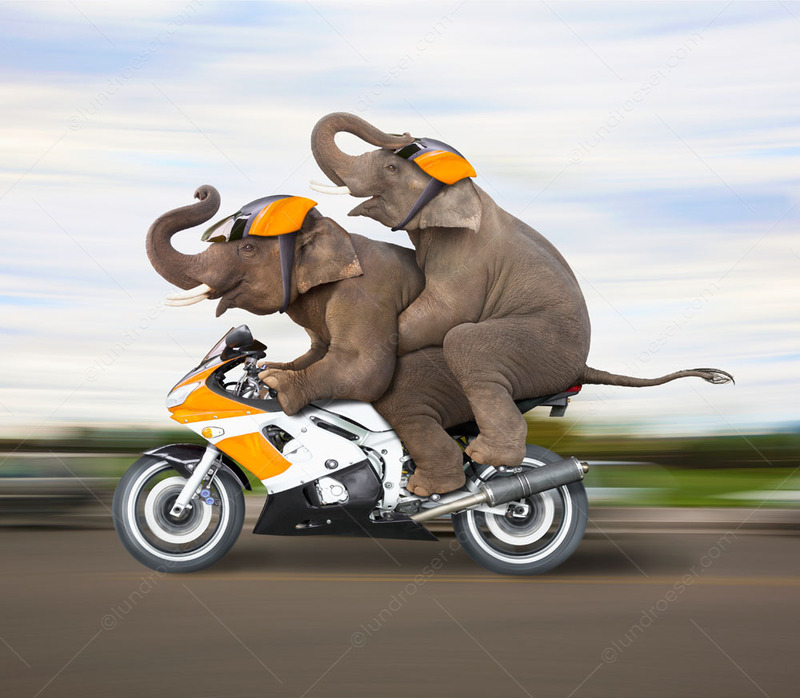 This image of two elephants riding a motorcycle certainly does that! The artist vision and attention to detail that Stephanie D. Roeser put into this image results in a realism that almost has one thinking OMG…were there really two elephants on a motorcycle? Throw in the right headline and you are sure to get your message across to the intended audience. In our collection we have over 100 anthropomorphic elephant stock photos ranging from an elephant on a bathroom scale to elephants perfecting the flying trapeze! If you are looking for a funny elephant picture to hang on your wall, to advertise your product or service, or for any number of other reasons, check out what we have to offer. Elephants make great stock images because of many of reasons. First, people love elephants and have an emotional reaction to them. We think of them as noble, emotional, strong, and, of course, with great memories. They are great a symbolizing the large and powerful. They also, of course, have a strong political symbology here in the United States. If you don’t see the elephant image you want in our collection just shoot us an email (john at johnlund dot com)…we create elephant images on assignment as well. If you can dream it up the odds are that we can turn it into a photographic reality!